This comprehensive 10-week programme is the first designed specifically for microinsurance leaders. With a unique learning-by-doing approach and by working with leaders in the sector, your expertise is magnified with powerful insights and practical examples. We focus on client-centric solutions that reduce the vulnerability of low-income people and make your business thrive. Learn how Pioneer Microinsurance got to 18 million enrolments and pays claims so fast. The Microinsurance Master programme is more than theory. Following 2 weeks of immersion training, you receive 8 weeks of tailored coaching by recognised industry leaders. Pioneer Microinsurance is an internationally recognised microinsurance champion. We camp out in their offices in the Philippines, going behind the scenes to learn about their unique distribution models and discover their ‘secret sauce’ in paying claims fast. 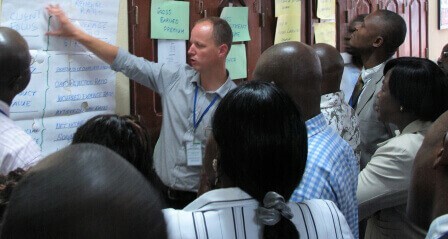 The training includes valued insight from leading innovation hubs like the ILO’s Impact Insurance Facility and CGAP. The insights, frameworks, and tools are designed to make your business thrive. You don’t learn to bake a cake by studying its recipe. You learn by baking one. With us you work on a challenging microinsurance assignment for Pioneer Microinsurance and learn from each other - by doing. Renowned microinsurance coaches help you get the training takeaways kickstarted back home. Leadership coaches include Michael J. McCord, President of the MicroInsurance Centre, Richard Leftley, CEO of Microensure, and Geric Laude, CEO of Pioneer Microinsurance. By attending Microinsurance Master, you will expand your leadership network in a way that outlasts the programme and keeps on providing opportunities into the future. "Microinsurance Master radically changed how we approach microinsurance. We are now prepared and equipped to thrive." "We now have a direct connection with likeminded organisations and some of the greatest industry leaders. Microinsurance Master is the first comprehensive leadership programme specifically designed for microinsurance leaders. Whether you are an established microinsurance provider looking for new inspiration or you are new to the industry and want to make sure you are receiving the best coaching available, this programme will give you what you need for your practice to level up and thrive. Microinsurance Master is led by Bert Opdebeeck, best known for his decade-long quest to promote the microinsurance key performance indicators: now accepted as an industry standard.